The Auction Bars indicator identifies higher timeframe ranges, displayed as Auction Ranges. These ranges display the current market value area of the ongoing auction. The accompanying congestion zones work as support / resistance where spike and reversal patterns frequently plot. You may register for FREE trial anytime. The overall concept for the higher timeframe ranges is inspired by thrust bars. However, the close of a bullish Auction Bar is compared to the high of the current Auction Range, not the high of the prior bar. A bearish Auction Bar will compare to the low of the current Auction Range, not the low of the prior bar. Accordingly, once the Auction Range breaks, the indicator will look to define a new Auction Range. Reversal patterns are defined as spike and reversal bars. The reversal patterns display as candidate around the current Auction Ranges and confirm once price action breaks the spike/reversal high/low level. The default confirmation requires a price one tick above the high of a key reversal or spike bar up candidate. Opposite, it requires a trade which is priced at least one tick below the low of a key reversal or spike bar for a down candidate. The Auction Bars come with several additional filters, allowing you to customize trade setups according to your risk preference. For example, a key reversal or spike pattern must also set preliminary swing high or low and you may define the swing strength period accordingly. Also, the price pattern candidates should be accompanied by significant range or volume, (narrow range and low volume key reversal and spike bars are eliminated). 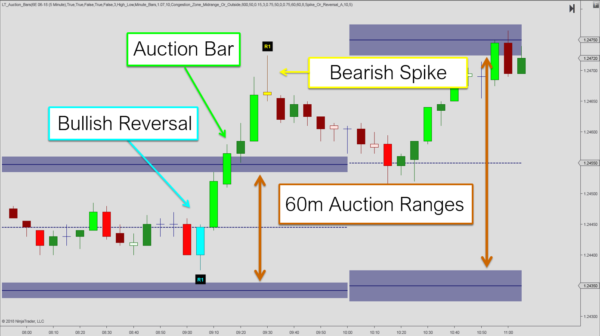 Furthermore, one may also specify that key reversal or spike bars should only appear outside the auction range, alternatively at the auction range or mid-range. It is recommended to apply additional price benchmarks as as filters for the Auction Bars. Tests show that support and resistance indicators, such as VWAPs, SessionPivots and the Opening Range can be combined with the Auction Ranges to improve probabilities.